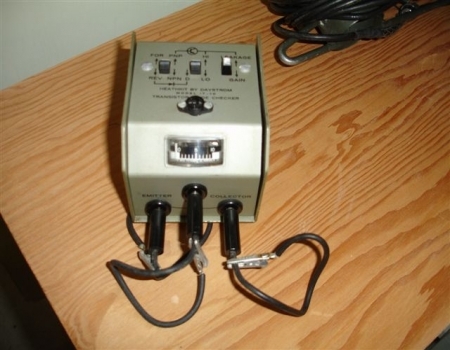 The Heathkit IT-10 is a transistor and Diode Tester. Using this item is a simple way to identify diode and transistor polarity and get a rough idea of their beta. In the picture on the right we have switches for Reverse and Forward voltage, High and Low states and Leakage and Gain of the component. Since I have tossed in some hints and kinks on many of the pages on this web site I figured I would continue the practice here as well. On the left is a photo of the schematic symbol of a transistor. But what kind is it, a PNP or a NPN? Yes, we could go to our books to find out. But try this easy to remember mnemonic the next time you run into a transistor symbol, "Not Pointing In". Notice the arrow on the transistor on the left and which way it is pointing. 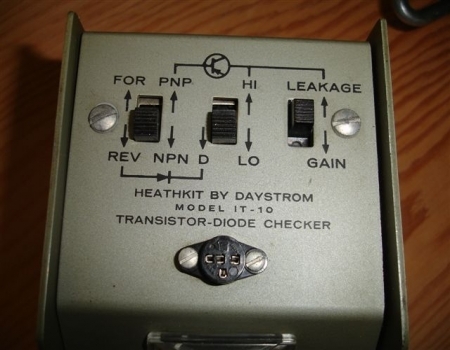 As we can see it is "Not Pointing In" so the transistor is a NPN. If the arrow was pointing inward as in the transistor symbol on the right it would be of the PNP type. The letters on the schematic symbol, B, C, and E refer to Base, Collector and Emitter.